How many of you are aware of the nine hill forts(navadurga’s). Yes, all these 9 hill forts are just few kilometers away from our garden city Namma Bengaluru. Today we BTCians set our foot out to explore the most unexplored fort hill “HUTRIDURGA”. Nestled between a bunch of villages in Kunigal Taluk, Hutridurga has made it into the history books. Before I narrate my experience let’s look at the history of this place. A fort hill, which means this place is of some historical importance, and this is undoubtedly true. The fort walls are built on the hill by Kempegowda during the 16thcentury (long ago right). The most interesting fact is that the fort walls remains intact to the hill even after decades. Historically, Hutridurga fort was the military bastion of Tipu Sultan against British, which was conquered later by the British (Lord Cornwallis) in 1791. When the British had conquered this fort, it had made it into the British media. 3 years back a team form a gov college tried some excavations and they did find Iron age potteries and few weapons. They say that these findings look like the ones found in Savandurga. A grinding stone from this place has been found in the London Museum which depicts the importance of this place. It is sad to know that very less importance is being given to such a place which has a very high historical importance. The most important fact of this place is about ‘kalluseve’ a rare burial practice where the dead body is not buried but kept in open for animals or birds to eat. Following this, people go back and collect the bones which are later buried. Our journey started from Majestic, 21 of us go into the bus and it was a 2 to 3 hour journey to the base. This time we had a very long intro session and by the end of the session all of us knew each other by their name, profession and from which place they are from. Trying to find the base of the hill, we were scared if we were climbing the hill itself. Our good, finally we found the base. Technically this is not a difficult trek. This hill is approximately 3000 ft above the sea level and well-defined steps and trail will take anyone to the peak. So, we were very casual on time and with a lot of pic stops we proceeded to the peak. The fort walls were easily visible from the trail we took, and they looked strong indeed. 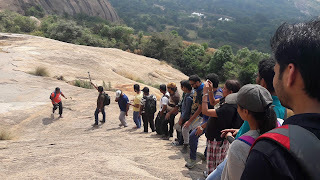 Steps have been carved on the hill itself to provide good grip and yes, a good place to take few cool group snaps. In an hour or so we were at the peak, we explored the peak for some time and set our foot out to check the surroundings of the peak and we could find some cave like structures along with tiny pathways. Looks like some alternative way used during wars or some sort of a hiding place. Got hold of some flat place and we started the most famous game ping pong. This time we included push-ups and indeed we could see a lot of talent. At around 1 p.m we left back to peak to have lunch. This time it was add-on and we started cleaning the hill, by collecting all the plastic. [Learning : Let the change start from you, and the world will follow you] A place with such historical importance has become an adda for some miscreants to drink and to dirty the place. Moving back to the base was quick, hardly we took 15 to 20 min to descend. We were way to early and had to make alternative plans to explore another place and there we head to the manchanaballe dam. This place was just 30min from Hutridurga and it is built across the Arkavathi river. Unlucky us the security did not allow us to go near the dam as we had no permission and it was a Sunday and we could not get one either. Disappointed yet happy to have seen the place from a far distance left the place and reached back namma Bengaluru by 6.30 p.m.[ Learning : Never get disappointed in case you fail on your first attempt to achieve something, keep trying and wait for the right time to achieve it]. A new bunch of 20 friends and again a lot of learning. This remains the best part of trekking, no trek goes without any learning.